In this Photoshop Effects tutorial, we're going to create a bit of an optical illusion, filling one photo with many smaller photos, or at least, many copies of a couple of smaller photos. The number of smaller photos you use for this effect is completely up to you. 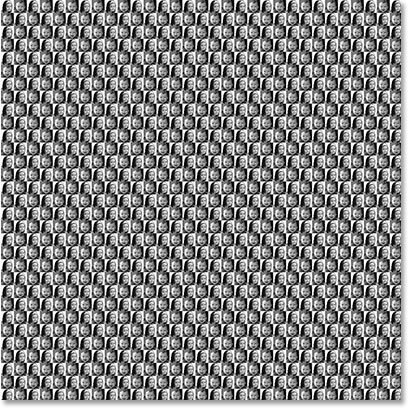 If you view the photo from a distance, you'll see the larger main photo, and if you view it up close, you'll see all the smaller photos inside of it. I originally saw this effect used in a job recruitment poster for a well-known restaurant chain, but it also works great with family photos, wedding photos, or just as a fun thing to do with photos of all your friends. A photo of a mother. Select the Rectangular Marquee Tool from the Tools palette. 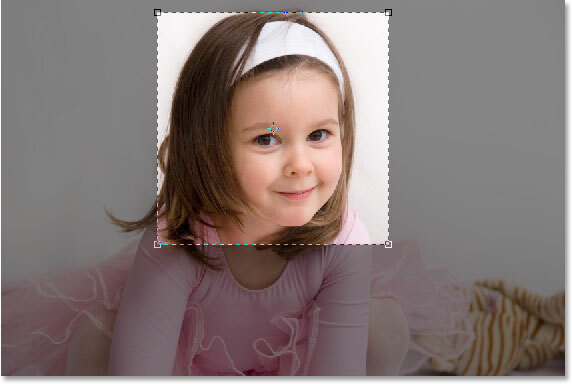 Drag out a square selection around the person's face. The main image is now cropped into a square around the woman's face. That's all we need to do with the main photo for now. 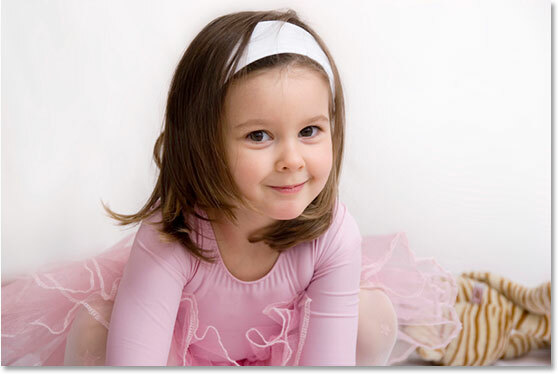 Let's work on the photos of the kids. We're going to crop the smaller photos next, and we'll be cropping them into a square, just like we did with the main photo. Rather than using the Rectangular Marquee Tool though, let's use the Crop Tool, since we're going to be cropping these photos down to a specific size. Now, the actual size that you crop them to is going to depend on the size of your main photo and also on how many smaller photos you want to use to fill your main photo with, so you may need to experiment a little with this. Enter "50 px" (pixels) for the width and height in the Options Bar. Again, you may need to experiment a little with the sizes depending on the size of your main image. Drag a selection around the head of the person in the first photo with the Crop Tool. The first photo cropped to 50x50 pixels. 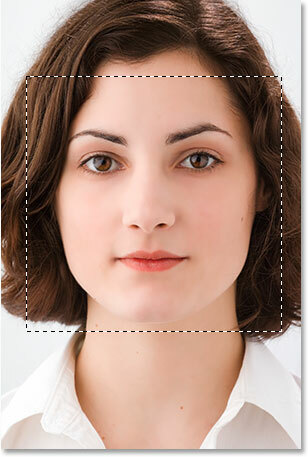 Drag a selection around the head of the person in the second photo with the Crop Tool. The second photo cropped to 50x50 pixels. 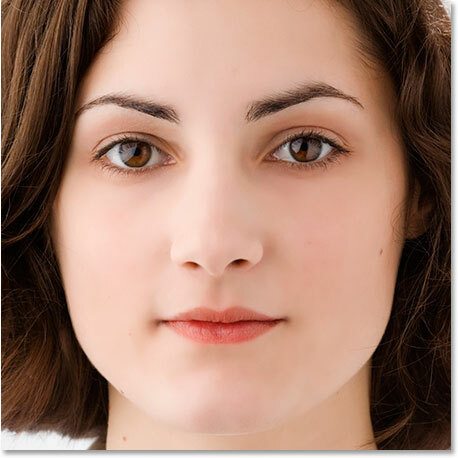 Enter a width and height for your new document that's twice as large as your two smaller photos. 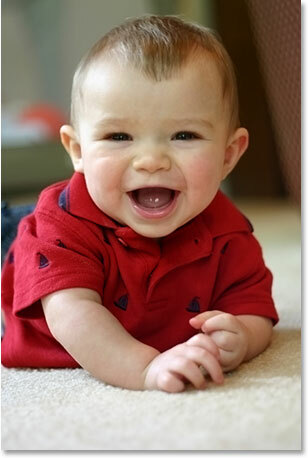 Also, make sure the Resolution for your new document is the same at it is for your photos. 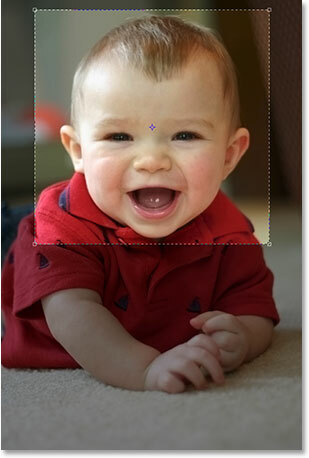 Select one of your photos and go up to the Image menu at the top of the screen, then select Image Size, which will bring up the Image Size dialog box. Check the value listed beside "Resolution". It will most likely say either 72, 240 or 300. Make sure your new Photoshop document is set to that same resolution value, which is located directly beneath the "Height" value. Click OK in the top right corner of the New Document dialog box to exit out of it and have Photoshop create your new document. Then click inside the first photo with the Move Tool and drag it into the new document. 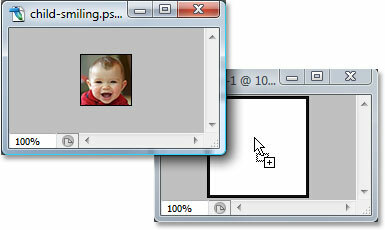 Click inside the first image with the Move Tool and drag it into the new document. Click inside the new document and drag the image into the top left corner. 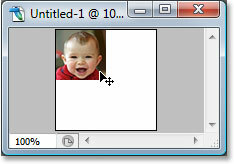 Hold down "Alt" (Win) / "Option" (Mac) and drag the image into the bottom right corner to create a copy of it. 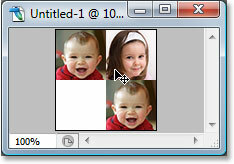 Drag the second image into the new document with the Move Tool. Drag the image into the top right corner. Hold down "Alt" (Win) / "Option" (Mac) and drag the image into the bottom left corner. 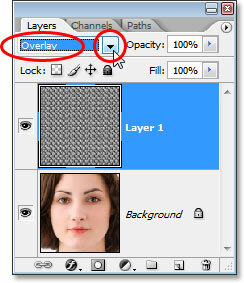 Photoshop's Layers palette showing five layers. The Layers palette now showing only one layer after flattening the image. 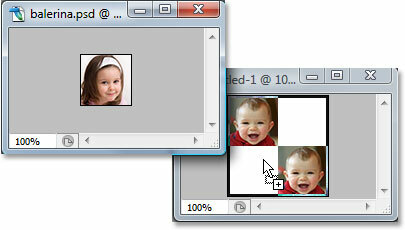 Press "Shift+Ctrl+U" (Win) / "Shift+Command+U" (Mac) to desaturate the image. Type in a name for your pattern, then click OK.
You can close out of that document window at this point, since we don't need it anymore. 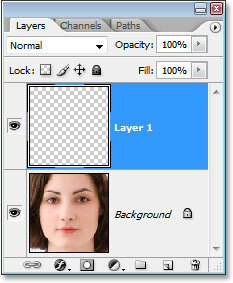 Click the "New Layer" icon at the bottom of the Layers palette. We're going to fill the layer with our pattern. To do that, go up to the Edit menu and choose Fill, or use the keyboard shortcut Shift+F5. This brings up the Fill dialog box. 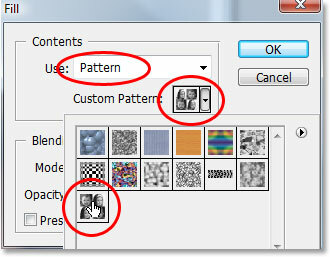 Set the Use option to Pattern by clicking the down-pointing arrow and selecting "Pattern" from the list. Then, to select your pattern, click on either the small pattern preview thumbnail or the down-pointing arrow beside it and then click on your pattern inside the selection box that appears. Your pattern will be the last one on the bottom row. Select your pattern from the Fill dialog box. The image is now completely filled with the pattern. 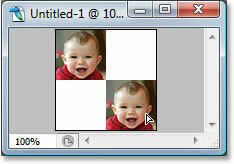 Step 10: Change The Blend Mode Of The Layer To "Overlay"
Change the blend mode of the pattern-filled layer from "Normal" to "Overlay" to blend the pattern with the image. After changing the blend mode to Overlay, the pattern becomes blended in with the image below it, creating our "optical illusion" effect. If you find your pattern looks a little too intense, try changing the blend mode of the layer to Soft Light rather than "Overlay" for a more subtle effect. You can also try lowering the Opacity of the layer in the top right corner of the Layers palette. The final "optical illusion" effect. And there we have it! 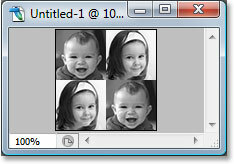 That's how to fill a photo with more photos in Photoshop! Check out our Photo Effects section for more Photoshop effects tutorials!